This cookie jar was made exclusively for the Federated Department Store by "The Cellar". 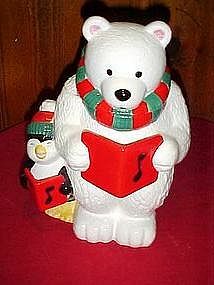 Wonderful quality made hand painted ceramic cookie jar measures 12" tall and is in perfect condition. A big white bear and little penguin pal dressed in scarfs and hat, hold their song books while caroling. A great cookie jar for the holidays, or to add to your collection.